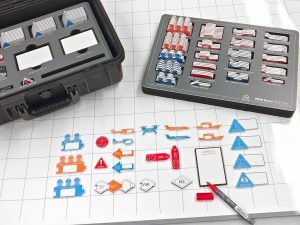 The engagement and learning advantages of hands-on tools for illustration, demonstration and practice are highly suited to maritime and marine training. 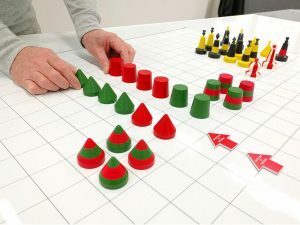 Understanding the essential messages conveyed by the position, colour, shape and presence of top-marks on buoys – and the corresponding action required for navigation are best learned and practiced through table-top simulation. Similarly, using models and props to demonstrate and practice the “rules of the road” designed to avoid collision at sea provides an engaging and versatile tool that is applicable over a range of abilities and experience. 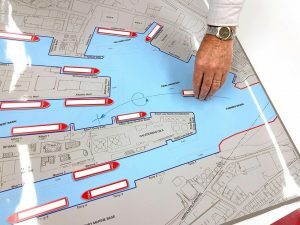 Aberdeen Harbour Creating awareness of how vessel movement and berthing is managed can be complex to explain – illustrating and Read more. Buoyage Set – Navigation Training Understanding buoyage is a crucial skill for mariners – demonstrating and reinforcing the message by Read more.